On you arrival at Delhi International Airport; you will be received by Premium Travel Planner representative and transfer to hotel; night at hotel. After breakfast at hotel, start enjoying Delhi sightseeing tour. You will visit Jama Masjid, Red Fort from outside and Raj Ghat, Gandhi memorial, India Gate, and Parliament House. After lunch enjoy visit to Humayun Tomb, Qutub Minar and evening time Gurudwara Bungla Saheb; Overnight at hotel. After breakfast at hotel, drive to Agra; en route visit Sikandra Tomb of Mughal Emperor Akbar, in Agra visit Red Fort, Itmad Ud Daula, If time permits enjoy sun set by Taj Mahal from River side, Night at hotel. Early morning visit to Taj Mahal with Rising Sun, return to hotel for breakfast and wash and change. After breakfast drive towards Jaipur and visit Fatehpur Sikri, the abandoned Mughal town. Here you will visit Jama Masjid, Jodha Bai Palace, Birbal Bhawan, Panch Mahal and the Buland Darwaza. On reaching Jaipur, check into the hotel for night stay. After breakfast at hotel, drive to Amber fort, situated on a hilltop. Enjoy an elephant ride here. From here return to city by visiting Water Palace by driving or stop for photographs; Later enjoy visit to City Palace, Observatory and Wind Palace photography. Evening time enjoy exploring walled city market of Jaipur. Night at hotel. After breakfast drive to Mandawa. It is a small beautiful town known for its beautiful havelies and forts. On reaching Mandawa, check-in at the hotel. After resting and relaxing for a while move out on an excursion to the magnificent Mandawa Haveli. 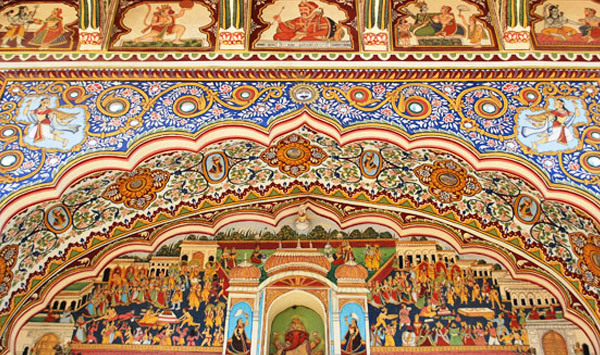 The intricately painted walls of this palace and the detailed work will enthrall you to the fullest. Some of the other popular havelis that you will visit during the course of the day include the Jhunjhunwala Haveli, Hanuman Prasad Goenka Haveli, Gulab Rai Ladia Haveli, Goenka Double Haveli, Murmuria Haveli, and the Mohan Lal Saraf Haveli. Enjoy an overnight stay at the hotel. Morning time at leisure, later in the day start driving to Delhi Airport, in time transfer to airport for boarding flight back to home.